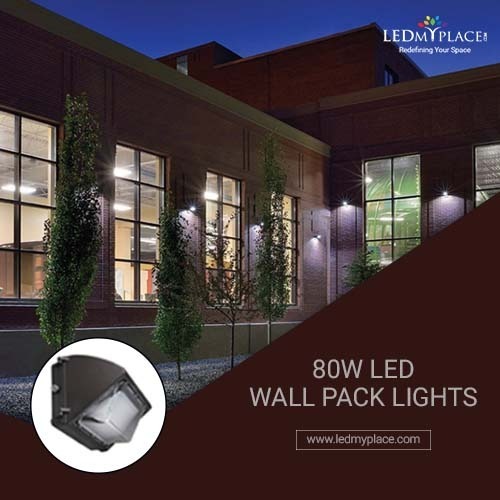 The conventional wall pack lighting most of the times result in higher energy costs, frequent maintenance costs and top of it, lower lighting performance as well and when we look at buying the LED wall pack lights over these lights, we can solve all such issues in an easier and pocket-friendly way. The LED Wall Pack lighting is one of the most trusted forms of lighting the outdoor places which can be replaced with conventional lighting fixtures such as HPS lights, HID metal-halides, and a halogen lamp. Out of many wall pack lights, you can use 80w LED wall pack light to create an excellent outdoor ambiance and that too without paying much in the form of electricity. • One of the advantages you will get while using these 80w LED wall pack lights is that you can save around 170 watts of energy if you replace them with 250w of any other lights. • Provide a high luminous efficacy of 127 lumens per watt, 10173-lumen output which reflects a better use of electrical energy into visible light. • The color temperature of this LED wall pack light is 5700K that is ideal for use as a security lighting fixture, also has a wider beam angle of 120 degrees. • The heat sink of these lights is designed to dissipate any heat that might be emitted during normal operation through an internal heat sink made of aluminum. • Use them for at least 50,000 hours or close to 6 years if used for even 24 hours and will last much long if used for half a day. manufacturer’s end on buying these lights. That’ not all, in addition to the above benefits, you will also get rebates & incentives from the power companies on buying these DLC certified 80w LED wall pack lights that are suitable to solve the outdoor lighting purpose much effectively.